The Geometric Clutch hypothesis proposes that the strain that develops between the outer doublets of the flagellar/ciliary axoneme acts as the principal control to regulate the function of the dynein motor proteins. In this hypothetical scheme, the forces that develop transverse to the axis of the doublets (t-forces) act as a clutch to engage or disengage the dynein arms from their binding sites on adjacent doublets. These forces can be easily computed from the longitudinal tension, or compression, on a doublet and the local curvature. A computer model has been developed based on the Geometric Clutch principle. 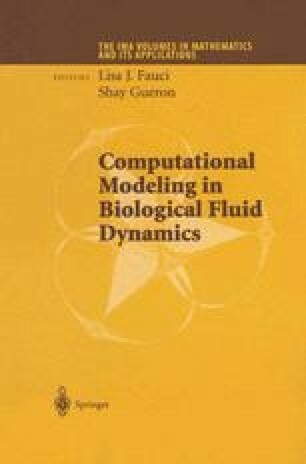 When the model is scaled as closely as possible to the physical dimensions and mechanical properties that have been measured in real cilia and flagella, the computed simulations successfully replicate the basic patterns of motility of the biological systems. Observed phenomena, such as the effective and recovery stroke of cilia, can be readily reproduced; and mechanical-sensitivity, a known property of cilia and flagella, is intrinsic to the computer simulation. Recently, the model has been further tested by comparing computed behavior and real behavior of bull sperm under identical conditions of mechanical restraint and dissection. The results of the real and computed experiments are in good agreement. The simulation accurately predicts the observed changes in the beating pattern, and the conditions that cause the beat to arrest.